Ditch your normal life and take a break to get in touch with yourselves in the relaxed, natural environment of Lalanathi. 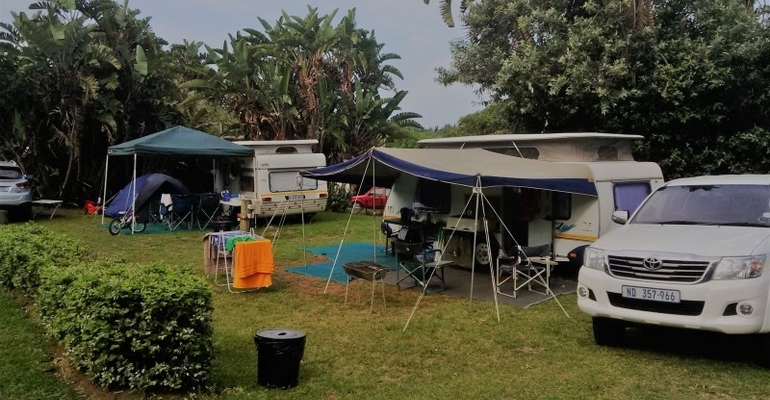 Bring your tent, caravan, trailer tent or motorhome and let your super fun hosts- Charlotte and Barry help you enjoy your stay to it's fullest, allowing the sound of the waves to soothe away the stresses of city life, leaving you relaxed and energised. We offer 45, well spaced, well shaded and level grassed stands- all electrified, within a fully fenced and secure area. The ablution and scullery facilities are clean with plenty of hot water. There are 3 Self Catering units, sleeping up to 5 persons each.The units each offer a fridge/freezer, microwave, crockery and cutlery. Added to that are two park homes- one that can sleep up to 5 persons, and the other up to 8 guests. We will spoil you with magnificent scenery, great fishing and beautiful beach walks. Swim, fish, surf or tan to your heart's content or just relax around the campfire. All round entertainment is available for the whole family- from the thrill of sandcastles and rock pools exploring to volleyball and other beach sports. There is a little people play area, trampoline, swimming pool, and a lapa with big screen TV, DSTV, pool table and darts for the teens.